Here are a few Christmas cards I made a few years ago. All were cut on the Cricut Expression. Cricut "Wrap It Up" cartridge - Gingerbread house (pg. 28) at 5"
The snow is Flower Soft in Polar White and is applied at the top edge of the roof. Finished Size: 4 1/4" x 5 1/2"
Cricut "Ornamental Iron" cartridge gate 1A (pg. 21) at 4 1/2"
Cricut "Trim the Tree" cartridge at 1 1/2"
Card Base - Core'dinations Gemstone - Jade cut to 6" x 12"
Printed on Recollections Cardstock - Kraft cut to 1 3/4" x 2 3/4"
Cricut "George & Basics Shapes" cartridge Rectangle 2 (pg.112) cut at 3 1/4"
I attached the glitter leaf to the card with hot glue. The picks had 3 leaves per piece which I cut with a wire cutter. Paper Crafts Magazine's website has lots of free sentiments and patterns you can download so check their site often for new additions. I had found some snowflake lights online, but I really didn't want to spend $20+ for them. So I took an old set of clear/white Christmas lights (non-LED) I had and used my Cricut Expression to cut snowflake shapes to attach to the lights. I apologize for the lack of photos, but clear laminate is extremely difficult to photograph well. Laminate your sheets together. For the the snowflakes I cut with the Wrap It Up cartridge, I had sprayed the inside of the sheets with blue glimmer mist and let them dry completely before cutting. The blue isn't noticeable, so I would either skip this step or spray several coats. The string of lights I had here was contained 100 lights so I cut 100 snowflakes of each type so there were 200 snowflakes were cut in total. "Wrap It Up" Cricut cartridge. Pg. 68 Snowflake at 2 3/4"
Snowflake 5b at 2 3/4"
Hot glue 2 Wrap It Up snowflakes to each other, leaving a section open so that light bulb will slide inside. Repeat this for the When It's Cold Outside snowflakes. Dab of hot glue on one side of light bulb. Hot glue opposite side of light. Apply a little hot glue to the plastic which holds the light bulb in place and place the light inside one of the snowflakes (I alternated the different types). Then apply hot glue to the opposite side. 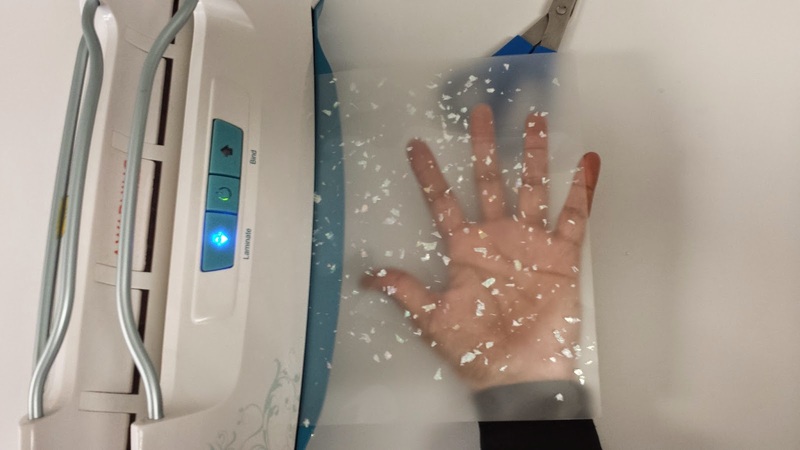 The glue holds well, but not permanently due to the slippery nature of the laminating sheets, so it would be possible to use the lights again without the snowflakes on them. These tangle quite easily, so they were fun to transport and untangle at the party site. I'm not too happy with the result (I wish the blue was brighter), but Munchkin #1 and her parents loved them. Front of finished castle on display at the party. I wanted to make a castle using the one in the Cricut "Once Upon a Princess Cartridge," and Munchkin #1's Frozen themed birthday party was the perfect occasion! I had to look online for a few other bloggers who had made this castle because there are no written instructions for it, just fairly vague pictures. This was the most helpful post. The only supply I had to purchase for this project was the "regular" Buffalo Snow flakes to add to the iridescent Buffalo Snow flakes I had on hand. "Once Upon a Princess Cartridge"
Laminate the sheets to themselves. Then cut all pieces needed for the castle at the settings above. No photos of this step as it's very hard to photograph clear laminate. Fold tower pieces as shown in the book (these "instructions" were hard for me to understand,but I only had 1 piece which had to be refolded the correct way.) Use hot glue to secure the tower pieces (tubes and caps) and interior "walls" as shown in Cricut book. Assemble all other pieces as Cricut book instructs. I added glitter glue to edges of cardboard to make it prettier. A completely unnecessary step. I used an old piece of cardboard which was in my office at work to use as a base for the castle. I attached a sheet of white gold shimmer cardstock (Recollections brand) to the center of the cardboard. I put hot glue at the bases of the inner towers and walls, and quickly attached the castle to the cardboard, centering it in on the white section. I then added glue all around the base of the castle. I added the clear glitter glue around the bottom edges of all of the tower caps and sprinkled clear glitter to them. 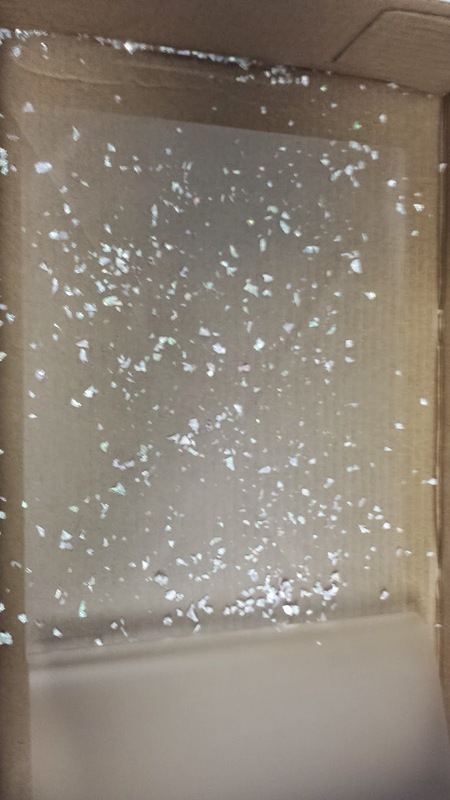 (Due to the static nature of the laminating sheets, the excess glitter wasn't completely removed from the rest of the castle. This was done before step 4 because of an accident with the glitter glue bottle (squirted all over the cardboard base), but it's better done after glittering the caps. Spread glitter glue (spread on with a brush or paper towel, in my case), or any other craft glue around the castle covering as much as the cardboard base as you want. I mostly wanted to just cover the blue sections. Mix a handful of iridescent and regular Buffalo Snow together in a bowl (I used the ziploc bag I kept the open Buffalo Snow bags in). Sprinkle the mixture onto the glue liberally. 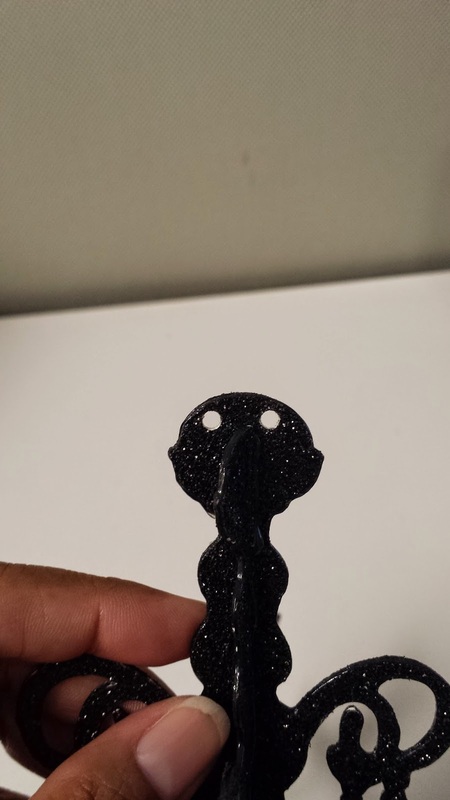 Let glue completely dry before shaking off excess. TIP: Set castle and base in a cardboard box (I used the top of a copy paper case) to apply the snow in to protect your floors as much as possible. Yesterday I drew the names for the Hunger Games giveaway. Congratulations to all the winners!! I have received everyone's mailing addresses and prizes will be sent out on Friday. I will be doing more giveaways in the future to follow this blog or follow me on Twitter (@VeronicaJ_N) for updates! I have been making the birthday banners for the Munchkins for a few years now and I always add their names. For Munchkin #1's Frozen themed birthday, I made use of supplies I already had on hand and was able to cut all of the letters from scraps from the Frozen Invitations I had made. 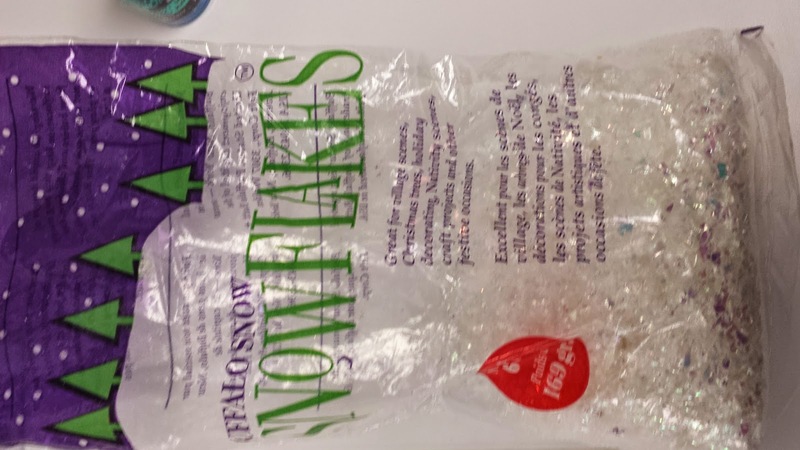 "Snowflake 5b" shape at 8 3/4"
Open laminating sheets and sprinkle snowflakes inside. These do not cut well on the Cricut, so try to have the flakes evenly and loosely spread. Once all of the sheets are laminated, start cutting snowflakes according to the settings above. Then cut the letters needed according to settings listed above. I don't have a photos of this, sorry. Glue letters together with your favorite adhesive. Then glue finished letters to the laminate snowflakes with a glue gun. Punch holes in snowflake (I did it in the "points" immediately to the left and to the right of the center "point") with a Crop-A-Dile or other hole punch. My holes were cut with the Crop-A-Dile's 3/16 hole punch. String the banner together with string or ribbon. I used 5/8" sheer white ribbon I had on hand. Since this is a very large/long banner, I string the words separately. This is very handy if you don't know where or how banner will be hung. 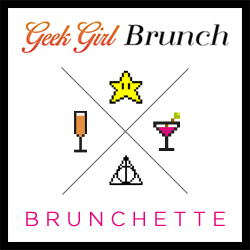 The words could be hung vertically over each other or lengthwise across a long patio cover (as we did). We use the support posts of the patio cover as the separation point between the words and tied the ribbon to the posts. I had made two of these chandeliers for Munchkin #1's birthday last year which was a Hotel Transylvania theme (see invites I made here). I received a request last week to make 1 or 2 of these on commission. They wanted the exact same ones which I had made for the party. I had to make this completely from memory as I hadn't written down how I had made these. 1st cut pieces as "normal"
Cut 1 of each piece at above settings on your Cricut. Then cut 1 of each piece using the "flip" option. Since this is a 3D object, all sides will be visible so you need to cover the white backside of this cardstock. No photo of this, sorry. You can still see white edges, so you can ink (not as effective in this case), paint or use glitter glue to cover the white edges. I didn't have enough black glitter glue on hand, and only had some "Slick" dimensional fabric paint in black on hand so that's what I used. I squeezed a generous amount of the paint onto a paper plate and painted any white areas (not the slits since I would fix those once assembled) with a very small paint brush. Hot gluing the pieces together. Slide Chandelier1 and Chandelier2 pieces together. The thickness of the pieces makes this a bit difficult so be patient and gentle. Once they are in position, use hot glue to attach the loose slits to the solid pieces. Other glues could be used, but you have to firmly hold the pieces together while it dries. 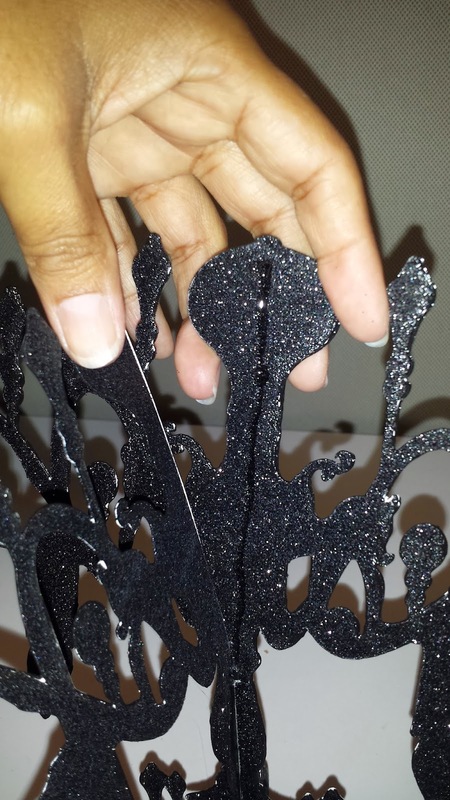 Your glue gun is your best friend for this project! I found that the white didn't show up much once glued, so I only had a few spots to cover up with the black paint. Punch two holes at the top of the chandelier (I did this on the piece which sits higher than the other) for attaching ribbon or string for hanging. Attach ribbon or string and your done! 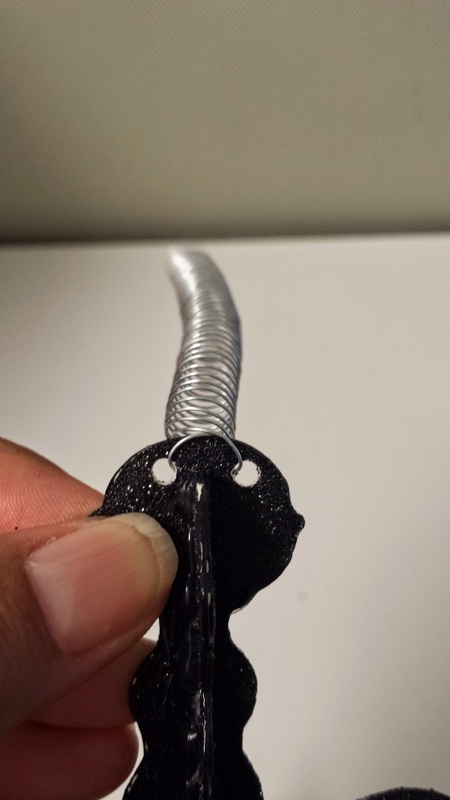 If using wire, see below for a quick tutorial on making a wire spring. Using a wire spring gives the chandelier movement and makes hanging flexible as you can extend the chandelier lower by stretching out the wire. I used 26 gauge wire which I had on hand and made a spring by wrapping the wire about 30 times (I didn't count, just went by eyeball measurement of how long I wanted it) around a wooden dowel. You'll want to stop every few wraps and twist/tighten the wire around the dowel while sliding it down the dowel together. See the second photo for what I mean. 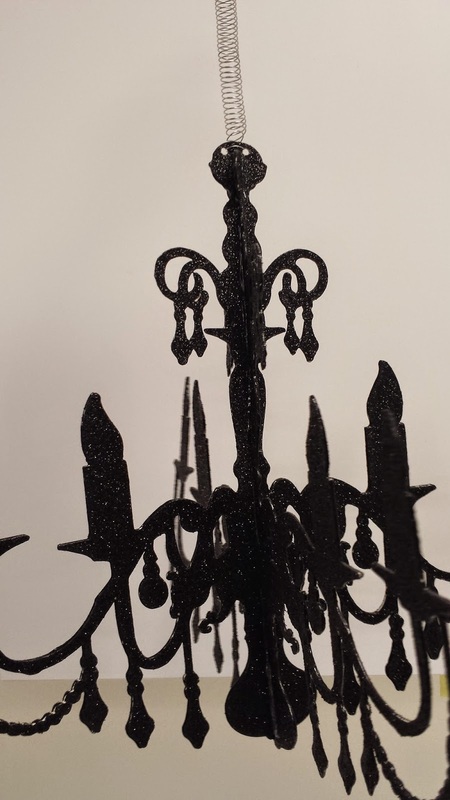 Extend one end of the spring and loop it through both holes in the chandelier. This is a perfect project for some Halloween party decor! Download and print your coloring pages. I put two images side by side on each page on a Word document (page is Landscape and borders are at 1/4" on all sides). I printed and cut Frozen poster images onto cardstock. They are sized 2 1/2" x 3 3/4". I cut snowflakes from Recollections Blue Shimmer paper (sold in 12x12 sheets) which was left over from the Frozen invitations I made for this party. Each snowflake was cut at 4" using the Cricut Winter Wonderland cartridge snowflake #23 (page 46 & 46). Settings: Pressure - High, Speed - Medium, Needle - 5). I didn't bother punching out the tiny holes in the snowflakes' centers because they would be covered up by the pictures. Snowflake cut, but not punched. Glue the snowflakes to the front of the coloring books and glue the picture on top of the snowflake as shown in the picture. Snowflake glued to the front cover. That's it! A very simple and budget friendly party favor, which is also a big hit with the kids. I also purchase small packs of crayons (like the ones they give out in restaurants) to add to the favor bags with the coloring books. You can get them on Amazon or eBay for very reasonable prices. 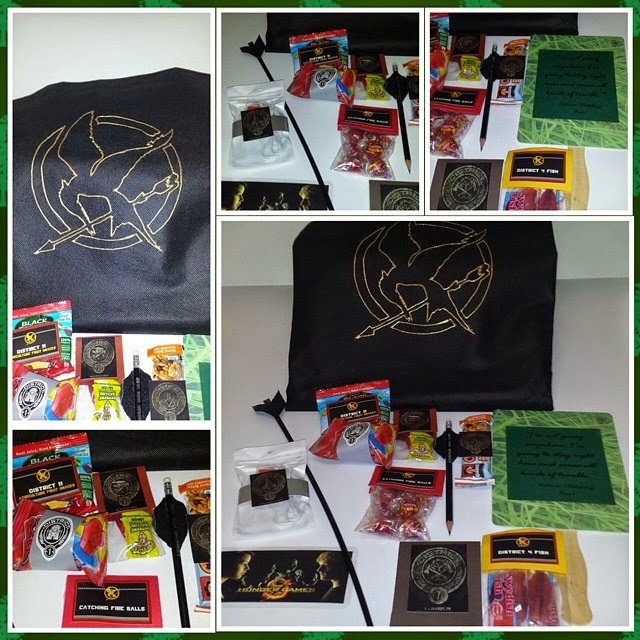 Hunger Games Party Favor Bag Giveaway!! 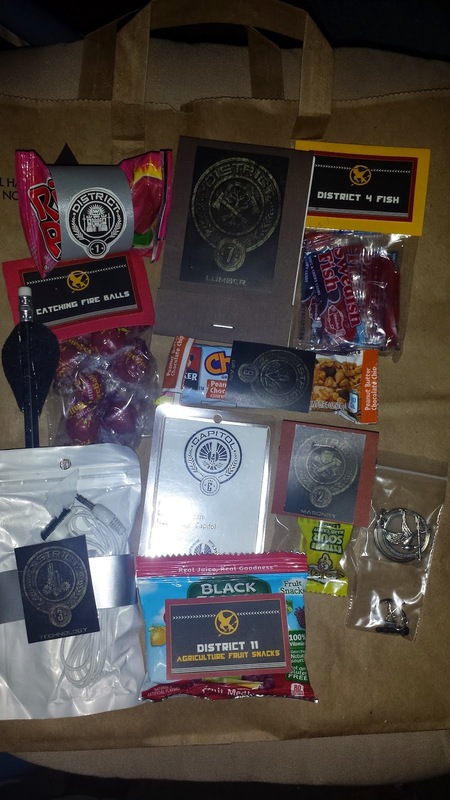 A few weeks ago I posted about my niece's Hunger Games Birthday Party which included at tutorial on the Mockingjay tote bag I made which was one of the 45 bags I made to hold the party favors for my niece's Hunger Games themed birthday party. Well, since a few people didn't show up (and I had a few bags without the Mockingjays painted on them), I have a few bags filled with all of the goodies the party guests received, plus a couple of items which they had to "purchase" in the Hob using the tickets they acquired by participating and/or winning the games we had. I'm making this very easy. I will ship these items anywhere in the world (and, yes, this is very expensive), and entry is very easy. First Prize - Everything you see here plus keyring and phone charm. Second Prize - Everything you see here plus a black drawstring bag. The fans, bookmarks and earbuds are all slightly different, and the distribution will be completely random. To enter: You may enter by Retweeting my each of my (@VeronicaJ_N) tweets for this giveaway (and ONLY tweets about this giveway count) once per tweet. You may one separate entry by commenting on this blog post (please include your email address if you don't have a Twitter account). If you have also retweeted my tweet, please add your Twitter handle/name in the comment so I can double your entry. For example: If I tweet about the giveaway 4 times and you retweet each of those, you gain 4 entries. 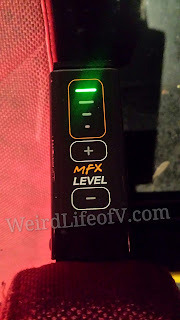 If you retweet each of those and you also leave a comment on this blog post, you gain 5 entries. The first two(2) names I draw will win one (1) of the First prizes, the next three (3) names will win one (1) of the Second prizes. Sweepstakes will begin at 8am Pacific Daylight Time, Wednesday, October 8, 2014 and end at 11:59pm PDT on Sunday, October 12, 2014. The drawing will take place on Monday, October 13, 2014 at 10am PDT. These necklaces are being given out in the goody bags for Munchkin #1's birthday party on Saturday. These are something anybody can make, and would even be a fun party activity for the kids. Clear stretch cording (.5mm or 1mm) - cut to approximately 24-26" per necklace to make knotting easier. The thickness of cording depends on hole size of your beads. I used both 1mm and .5mm for my necklaces. Cut the cording to approximately 24" length. String beads as follows: Fuschia, Aqua, Fuschia, Lt. Aqua, Fuschia, Aqua, Fuschia, Lt. Aqua, etc. Once all beads are strung, tie the ends together in a knot (double, triple, quadruple knot as needed). Trim off excess cord. The snowflake beads I bought have holes on two sides, but I want to use these as pendants, so I attached a split ring onto one hole. NOTE: Jump rings can also be used and will be much easier to attach, but I wanted something sturdier. The snowflakes I used are quite thick so attaching the split rings took some effort (and a few ruined split rings). Attach snowflake to necklace by sliding the split ring between beads onto the cording. These necklaces have approximately a 10" drop plus the pendant (which measures just over 1"). There are more Frozen inspired crafts made for this party. I'll be posting those soon!